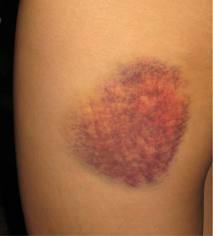 Bruises result from a damaged or broken blood vessel due to a skin injury. Once these blood vessels are injured, the blood leaks into the surrounding tissue, causing a bruise. However, bruising can sometimes occur without a reason. Can anemia be the cause? Yes, anemia can cause bruising. Unexplained bruising is common for a certain type of anemia, known as aplastic anemia. Aplastic anemia is a medical condition characterized by not only a low count of red blood cells but low white blood cells and platelets as well. When the platelets count is lower than normal, the blood clotting process is impaired, often leading to excessive bleeding and bruising. Prolonged bleeding from cuts, etc. Aplastic anemia has a slow progression over a couple of weeks and months. Sometimes, it may come on suddenly and even be life-threatening. Aplastic anemia may also become chronic. Another type of hereditary aplastic anemia is the one diagnosed among adults. This newly discovered type of hereditary aplastic anemia is caused by a shortening of the telomeres, the ends of chromosomes. Special tests are required for the diagnosis of this type of aplastic anemia. Does anemia cause bruising? Yes. Whenever aplastic anemia is diagnosed as the cause of bruising, regardless if it is hereditary or acquired, proper treatment is necessary in order to control the bruising. The following treatments are available for aplastic anemia. In order to relieve the symptoms of aplastic anemia and to control bleeding, blood transfusions are often necessary. It is good to know that blood transfusions are not a cure for this type of anemia. Blood transfusions provide only a temporary relief of its signs. Transfusion usually includes platelets or red blood cells. A transfusion of red blood cells increases the count of red blood cells in the blood, while a transfusion of platelets helps prevent excessive bleeding. In general, there is no limit when it comes to the number of blood transfusions a person can have. However, a blood transfusion has its own possible side effects and complications. With multiple transfusions of red blood cells, an iron accumulation in the human body occurs, damaging the vital organs. Moreover, the human body may develop antibodies against red blood cells, which will make them less effective. Regular use of immune suppressants will prevent this complication. In cases of severe aplastic anemia, stem cell transplantation is the only treatment available which can be successful. Stem cell transplantation is commonly known as bone marrow transplantation. This treatment is more suitable for young and healthy patients. A matching donor is required, usually being a sibling. Just like any other treatment, stem cell transplantation has its own risks and possible complications. There is always the chance of the body rejecting the transplant, which results in life-threatening complications. Immune suppressant medications are necessary for those patients who can’t undergo bone marrow transplantation and for those whose aplastic anemia is caused by autoimmune disorders. Immune suppressant medications tend to suppress the activity of the immune system, which will help the bone marrow to recover faster and generate new blood cells. Once these medications are stopped, there is a possibility that aplastic anemia returns. Certain types of medications such as epoetin alfa, filgrastim, etc. may help stimulate the bone marrow to produce new blood cells. Aplastic anemia will make your immune system weak. This means that your organism will be more prone to various bacterial and viral infections. For this reason, various antibiotics and antivirals are often prescribed by your doctor. Does anemia cause bruising? Yes. If aplastic anemia is due to chemotherapy or radiation therapy for cancer treatment, once this treatment is completed, anemia improves. If pregnancy is the cause of aplastic anemia, once it ends, the anemia improves. If no improvement is seen after the pregnancy terminates, other medications are necessary.